There is a wealth of actionable marketing information available to you through analysis of your website’s visitor data. Remember that your goal is to enhance your visitor experience, leading to attaining your business objectives, whether it’s improving your sales, improving your customer service, or expanding your audience. Frequently measuring and tracking your visitors and how they interact with your website is the key to reaching those goals. If you don’t implement this feedback loop, you are passing up essentially free marketing information, and you are defeating the purpose for why you originally wanted to build or re-design your website. Linking Google Analytics with Google Webmaster Tools allows viewing of SEO-related information right inside of Google Analytics. There are many excellent reports we provide which help determine how your website is performing, and where there is room for improvement. Establishing a feedback loop is imperative for continuously measuring and improving the performance of your site. How will you know if you are meeting your business objectives if you don’t measure performance. We will track and monitor from where your visitors are coming, from search engine, to referral, to direct and campaigns. Referral traffic are those visitors that came from links on other websites. You will also be able to see which search engines are sending you traffic, and which keywords were used in the search. By tracking the percentage of search traffic over time, you can determine how well your SEO efforts are paying off. We also generate reports on your “content”. These reports give information about which pages were most frequently visited and how much time was spent visiting on those pages. This information lets you know which parts of your website are most popular which, depending on how your content is organized, can give you indications on how well your marketing campaigns are performing, or which products/services are generating the most interest. An extremely useful report that we generate is centered on “goals”. The goal tracking feature in Google Analytics allows us to specify a URL or other “event” that we want the visitor to accomplish on your site. . For example, if you want visitors to sign up for your newsletter, we can measure how many visitors accomplished this goal, how they arrived there, and also where they may have dropped off along the way. Clearly, your Website Design and Implementation doesn’t end when the site goes live. 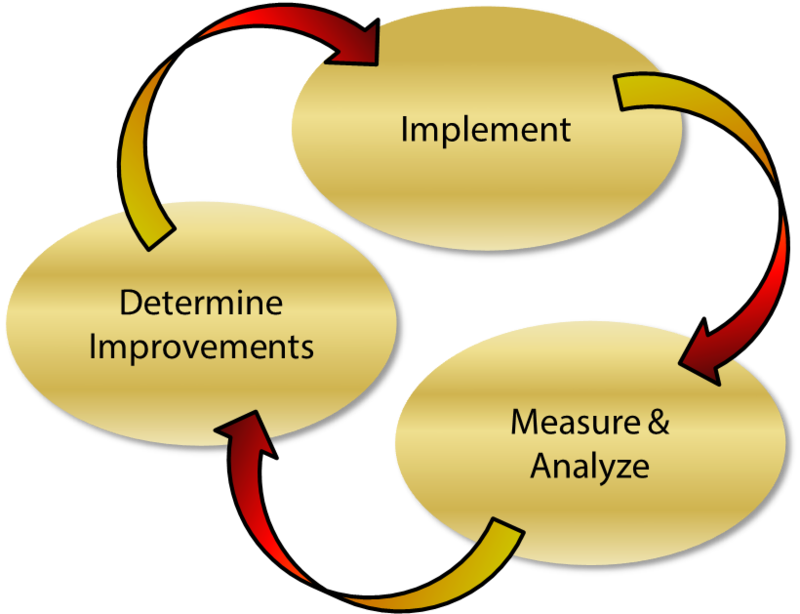 You must continually measure and monitor how it is performing, such that you can make improvements on a regular basis that will enable you to reach your business objectives. Continuously improving your website based on your customer experience will also keep your website fresh and interesting. This leads to improvements in your business as well as your search engine rankings.